André Breton, Paris; Peter Watson, London; (The London Gallery, London); Sybil Mesens [d. 1966], Brussels; her husband E.L.T. Mesens [1903-1971], London. Mr. and Mrs. Ephraim Ilin, Jerusalem; purchased 1984 through (Robert Elkon Gallery, New York) by NGA. Exposition d'Art Français, Tokyo, 1932, no. 46. The International Surrealist Exhibition, New Burlington Galleries, London, 1936, no. 345, as The Gaze of Amber. Trois Peintres Surrealistes, Palais des Beaux-Arts, Brussels, 1937. De vier boofdpunten van het surrealism, Anvers, The Netherlands, 1956. L'École de Paris dans les collections Belges, Musée National d'Art Moderne, Paris, 1959, no. 146. Louisiana Museum, Humlebaek, Denmark, 1967. Six Peintres Surréalistes, Palais des Beaux-Arts, Brussels, 1967, no. 76. L'Art en Europe Autour de 1925, L'Ancienne Douane, Strasbourg, 1970, no. 208. 50th Anniversary, Tel Aviv Museum, 1982. Yves Tanguy: Retrospektive 1925-1955, Musée national d'art moderne, Paris; Staatliche Kunsthalle Baden-Baden, 1982-1983, no. 33, repro. Solomon R. Guggenheim Museum, New York, 1983. Yves Tanguy and Surrealism, Neue Staatsgalerie Stuttgart; The Menil Collection, Houston, 2000-2001, no. 33, repro. 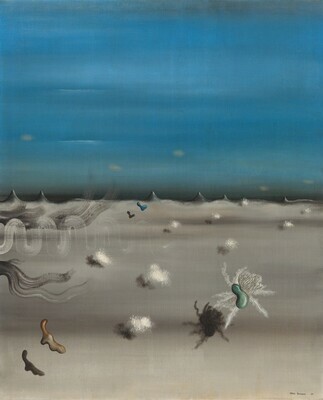 Yves Tanguy: A Summary of his Works. New York, 1963: no. 86, repro. Waldberg, Patrick. Yves Tanguy. Brussels, 1977:141, repro. 125. Oesterreicher-Mollwo, Marianne. Surrealism and Dadaism. Oxford, 1979:repro. 31. European Paintings: An Illustrated Catalogue. National Gallery of Art, Washington, 1985: 385, repro. Strick, Jeremy. Twentieth Century Painting and Sculpture: Selections for the Tenth Anniversary of the East Building. Washington, D.C., 1989: repro. 48, 49. Le Bihan, René, Renée Mabin and Martica Sawin. Yves Tanguy. Quimper, 2001: repro. 30.